The For Sale By Owner is only 8% of home sales in the U.S. as a whole, and probably a much smaller percentage in some rural areas like Sequim, Washington. 85% of For Sale By Owners fail to sell their own homes and end up listing with a real estate broker. Some give up entirely. Why? Why is it so hard to be a successful For Sale By Owner? In this video I share the truth, and nothing but the truth. After four decades of experience and 20 years of law experience, I’m not guessing on this subject. The marketing necessary and the way the real estate industry stacks the deck against the For Sale By Owner will all be revealed in this video. By the way, you can enlarge this video to fit your screen, and I recommend you choose HD 1080 quality in Youtube so it will be high definition. I recommend reading my latest book, The Seven Myths of Selling Your Home. If you need to sell your home before you buy a home in Sequim, you’ll find some very practical information that could save you from major mistakes. I share insider secrets that very few people inside or outside the real estate industry understand. You’ll find Seven Myths on Amazon in either paperback or kindle versions. Should Buyers Look for a FSBO? What About For Sale By Owners? When you are looking for a home in the Sequim or Port Angeles area, should you also look at the For-Sale-By-Owner, also known as the FSBO. There are several big hurdles for buyers when it comes to hunting for a FSBO. The first big challenge for a buyer is finding the FSBO. Buyers are using online MLS sites, and FSBOs do not show up on MLS sites (with some minor exceptions). Even for the buyers who use Zillow or Trulia, those IDX data feeds are also coming from the local MLS, so if a FSBO is not listed by an agent and put in the local MLS, it doesn’t show up as a listing for sale in Zillow or Trulia. It will still show up as all properties do in Zillow, because Zillow is now including every home in America, whether it is listed or not. But that is no help to buyers. Sometimes you can’t tell if a home on Zillow or Trulia is for sale, or if it is just part of the massive database. Should buyers be looking at For Sale By Owners? Can a buyer find a good deal with For Sale By Owners (FSBOs)? Here’s the truth about FBSOs that may surprise you. Every FSBO I’ve ever talked to had a bad experience with a Realtor. A lot of people, not just FSBOs, had bad experiences with Realtors. That’s not front page news. Unfortunately, instead of finding a professional Realtor who really is honest and competent, For Sale By Owners take a different path. They decide to become their own experts. In over 85% of the cases, FSBOs eventually give up and re-list with a Realtor according to a study by the National Association of Realtors. FSBOs are for-sale-by-owners, and periodically a FSBO will ask me a question. This question from a FSBO was a very good question and one that I think many others will find relevant, both sellers and buyers. Here I share the question and my response. I appreciate and understand why you would put your condo on the market as a FSBO. Unfortunately, there are several reasons that strategy may not work for you. These reasons are things I’ve learned during the past 37 years in real estate, and they have been affirmed again and again. Selling a home without the assistance of a professional Realtor is known as a for-sale-by-owner, colloquially known as a FSBO (pronounced “fizbo”). 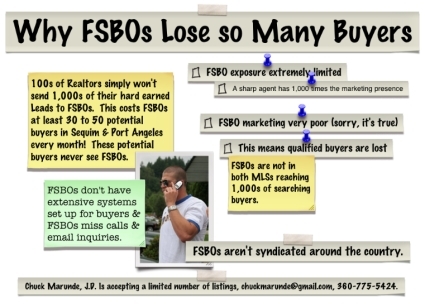 Over 85% of all FSBOs do not sell themselves, but end up listing with a Realtor. Why? What is so hard about selling a home oneself? Here’s a simple graph that presents complex truths about why FSBOs lose so many potential buyers. I thought a picture might be worth more in this case than 1,000 words. Click on this image for an enlargement. Question: I found your website doing a search for “for sale by owner” information. I am considering the pros and cons of listing this myself, or enlisting a broker to help me out. I am impressed by the amount of information you provide for free. 1. I am in no hurry for a sale. If it takes the market improving to the point that my asking price is more obtainable, I may be willing to wait for that. 2. Property is 1+ acre in a location that would be perfect for a small business owner. we are on a busy road, and although right now it is zoned residential (the home is manufactured), there are several businesses very nearby. It is only a matter of time before this property is used commercially as well. Thank you for your time and thank you also for being so generous with the information on your website. One of my pet peeves is overpriced real estate. An overpriced home on the market can actually cost a seller a lot of money. A home only sells for fair market value (FMV), not more than buyers are willing to pay. That’s what FMV is–what a ready, willing, and able buyer is willing to pay for a home. Yet we still see both FSBO’s and agent listings on the market above FMV, and some are substantially above FMV. The article points out that a house that is priced right for the current market sells within a reasonable time, but one that is overpriced will sit on the market while the market prices decline, and when the home does finally sell, it sells for less than the FMV of that home when it was first on the market. The statistical proof showed that in a market where a home that was listed for $599,900 (FMV) and which sold for $599,000 (almost full listed price within 30 days), a comparable house that was overpriced at $634,900 actually sold for $585,000 months later when the market had declined even a little more. There’s another solid reason not to overprice your home. When a home first goes into the MLS and is advertised at that price, you have an opportunity to reach a small percentage of buyers who may be interested in your home, can actually afford it, and who are ready to do so now. An overpriced home may cause them to look elsewhere. And this is the clincher, buyers rarely come back to look at the same home again even after you’ve reduced the price. That’s true. Not only will most buyers not come back to see if you’ve reduced the price in the months to follow, but by the time you actually do reduce the price in the MLS, those original buyers are long gone, most having purchased a home that was not overpriced. So as a practical matter, you have one shot at each buyer. 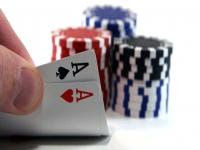 Sometimes a seller who wants to gamble by asking far more than his home is worth will say, “I’m in no hurry to sell. If it doesn’t sell, I can hang on to it until prices go back up.” If that’s your sentiment, then don’t waste time and effort listing it for sale when you know it won’t sell. Hoping you will get lucky and find an uninformed buyer who will pay way more for your property than the true FMV is a pipe dream. Buyers are very intelligent these days, especially with the availability of the powerful tools on the Internet. If you want more, then don’t list your home until prices actually do appreciate to that level. Believe me, no one will buy an overpriced home. This is such an important lesson for homeowners who want to “test the market” with an excessively high price. Don’t do it. You could lose a lot of money by the time you end up selling it for much less in a slower market. Selling your home as a FSBO (for sale by owner) puts you at a huge disadvantage from the starting gate. I’ve seen that many times over the past 30 years. I don’t do any cold calling of FSBO’s. I’m pretty darn busy just working with buyers, and I don’t have the time. Keith Sorem, an agent in Glendale, California, wrote a concise article on FSBO’s, and with his permission I’ve reprinted it here. In a “normal” market about 10% of homes sell without professional representation. This is not a normal market. There have been significant changes in how appraisals are conducted since May 1st causing major problems in valuation. so buyers who finance their purchase are having to cancel escrows, sellers are having to lower prices. In August there are new underwriting guidelines coming out, which are going to make it even harder for buyers to qualify. According to a recent survey buyers have a Realtor represent them about 90% of the time. From the buyer’s perspective they get a “free agent”, so it is a good deal for them, In most markets there is a lot of inventory, so the problem by selling on your own is that the Realtors are not looking on other websites for their buyer’s homes. Your listing basically does not exist. My suggestion is that you should interview a few Realtors, have them analyze your property and situation, then if you want to try it on your own, go ahead, you might get luck. Know that 76% of sellers eventually list with a Realtor. 5% sell to someone they know, 5% sell to someone they don’t know. When they sell they, on average, sell for 16% less than the average sold by Realtors. For a full discussion of the two multiple listing services and how marketing real estate compares, including the FSBO issues, see the Sequim MLS and the NWMLS. If you are a For Sale By Owner, FSBO, and you want the best professional advice from years of experience to help you make tough decisions, Chuck Marunde is offering a free consultation. Now any Realtor can offer a free consultation, right? This is much more. First, you get a consultation with a 30-year veteran who practiced real estate law for 20 years. 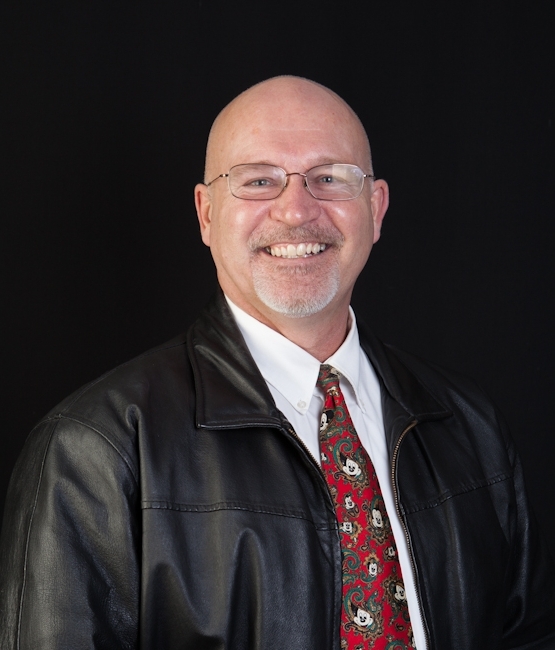 He’s been involved in nearly every aspect of a real estate transaction. He’s negotiated hundreds of transactions, drafted hundreds, and helped clients avoid litigation and resolved many difficult issues. Second, your free consultation includes what you would expect of any Realtor, plus honest and frank discussions about how selling really works in the real estate industry, how the competing multiple listing services actually work (or don’t), what advertisting works and doesn’t work, what role the Internet plays in marketing your property, and where the buyers are coming from and exactly what they want. I track these subjects with research and analysis, and I offer these free in this consultation. Third, I open up what I am doing, so you can see how to do what you need to do. Now, I’m not going to share my trade secrets that I don’t want other Realtors to know about, but you will be surprised at how much I do share. Fourth, you will be so impressed with how hard I have worked to create the systems I have in place that there is a significant probability that you will want to list your property with me, BUT there is absolutely no obligation and no pressure to do so. I won’t even ask. There’s a lot at stake in this market if you want to sell your home. Don’t you want to be sure that you will do everything possible to get the highest price in the least amount of time? Email me or call me at 360-775-5424. I’d be delighted to share whatever I know and have learned with you. Do you have a Sequim home for sale, a Sequim FSBO? Retired real estate attorney Chuck Marunde, now a real estate broker, Internet marketing consultant, and writer, wrote an eBook for homeowners who have thought about selling their own homes. The eBook is short and to the point, but with the content and the resources made available in the eBook, there are over a 100 pages of solid content, especially for the Sequim and Port Angeles homeowner. The subjects covered include topics on arriving at an accurate fair market value, appraisals, advertising and marketing, negotiating like an expert, an MLS tool for homeowners to look at what is for sale now in Clallam County, free classifieds for advertising, a list of document titles for the legal documents that may be needed, and traps for the unwary (like the Form 17 Seller’s Disclosure). UPDATE: MICROSOFT UPDATED THEIR OPERATING SYSTEM TO WINDOWS 8+, AND THEY BROKE THE SYSTEM BECAUSE NOW THIS BOOK CAN NO LONGER BE OPENED ON A WINDOWS COMPUTER. THIS IS ONE MORE REASON I MOVED OVER TO APPLE COMPUTERS. MICROSOFT CHANGES OPERATING SYSTEMS AND SOFTWARE ALL THE TIME IN WAYS THAT LITERALLY DESTROYS OUR ABILITY TO USE SIMPLE PROGRAMS AND DOWNLOADS AND FEATURES. SO THIS EBOOK WHICH HAS BEEN VERY POPULAR WILL NO LONGER OPEN AFTER YOU DOWNLOAD IT, THANKS TO MICROSOFT. I WILL HAVE TO RE-WRITE THE ENTIRE BOOK. UNTIL I DO THAT, IF YOU OWN A HOME IN SEQUIM, YOU CAN SCHEDULE AN APPOINTMENT WITH ME, AND I WILL SHARE THE CONTENTS AND MY EXPERIENCE WITH YOU IN THE COMFORT OF YOUR HOME, NO OBLIGATION. 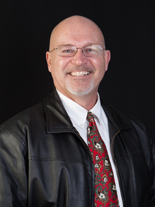 Sequim FSBO information is offered as a courtesy of Chuck Marunde, J.D. and SequimRealEstateNews.com. Why Can’t I Just Sell My Own Home? What’s So Hard About That? From a FSBO in Sequim I received the following question. Enclosed is my response. Question: I’m interested in selling my own home for one reason–to save the real estate commission. What’s wrong with that? Answer: Nothing. That’s a good American reason to be a For-Sale-By-Owner. The question is, can you? In other words, do you know how to price your home? Do you know how to collect accurate information on fair market value? Do you know how to make adjustments in the prices of the comparables? Do you know the most and least effective ways to advertise and market? Do you have experience developing compelling sales scripts that will attact buyers? What about negotiating? Can you negotiate for top dollar while not killing a transaction with a good buyer? Do you know all about terms that change your net proceeds? Are you aware of the top mistakes that FSBO’s make regularly? Do you know about tax implications? Are you a competent document draftsman? Can you include all relevant terms and langauge without ambiguities? Do you know what legal documents are required by law in Washington and Clallam County, and in Sequim and Port Angeles? Can you help your buyer get a loan (there’s much more to this step than 99% realize)? Can you provide the kind of attention and focus needed from the day there is a written agreement with your buyer until closing? Iin other words, do you know how to be a transaction coordinator? Sequim FSBOs and Port Angeles FSBOs are having a tough time selling their homes, just as real estate agents are listing but not doing much selling. The market is slow, and on top of that we are in the slow winter months for home sales here. While it is true that sales are few and far between right now, it is also true that the Sequim and Port Angeles areas have not suffered the crashing prices that so many other areas of the country have. Las Vegas is down by 30% and even more in some areas. My son recently moved to Vegas in a job transfer, and has made an offer on a 3 bedroom, 2 bath ranch home in a nice area. The home was listed at $139,000, and his offer was accepted by the owners at $129,000 subject to a short sale (the bank approving the purchase since the net proceeds will be less than the current balance of the owner’s mortgage). Okay, that’s an amazingly low price for a nice home like that in a nice area, but the Vegas real estate market crashed. Developers and builders overbuilt, and the economy there has taken a huge hit, there have been job layoffs, and a lot of homes are in foreclosure. No so with Sequim and Port Angeles. Some might say, “Gee, I wish we could buy a house in Sequim for $129,000.” If you could, that would mean that our market had crashed, that our local economy was in shambles, and that thousands of homes are in foreclosure. But none of that is true, so you cannot buy a house here for $129,000. Thank God! Thousands of homeonwers here are thankful that their homes have not been devalued. This is actually good news for Sequim and Port Angeles homeowners and investors who are thankful they haven’t suffered terribly like so many around the country. While this may not be fantastic news for buyers, it should be encouraging, because it means we have a stable real estate market here, and that is very good news. Our prices are still down and sales are down, but nothing like Vegas. You can put lipstick on a slow real estate market, but it’s still a slow market. You can lower the price on your home to sell it quickly, but it’s still a slow market. Lowering the price may not be the powerful incentive it would be in a normal market. You can stage your home with the nicest furniture and decorations, but it’s still a slow market. You may have a beautiful home in a wonderful area, but it’s still a slow market. You can have $40,000 in landscaping, but it’s still . . . 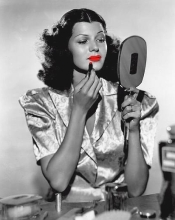 If buyers are not showing up, and they are not, you can use the brightest red lipstick on the market, but it’s still . . . I have talked with many homeowners who have told me they want to sell their homes quick, within a month or two. Hmm. Maybe we can do that, if we connect with one unique buyer who falls in love with this home, but it’s still . . . But being patient is not enough. You also have to be smart in how you market your home, especially in a slow market. Are you a FSBO, aka for-sale-by-owner, aka for sale by owner? Or are you planning to list your home for sale with an agent? In either event, in order to sell your home for the highest possible price in a reasonable period of time, you must have a good advertising plan. If you don’t, you could get stuck with your house on the market for a long, long time, or you could sell it for much less than you should get at FMV (fair market value), or both. This is the 3rd installment in our series entitled, “How to Advertise a Home for Sale. ” Today we look at Using the Internet to Sell Your Home. The Internet is unquestionably the most powerful tool for buying and selling real estate today. Traditional advertising has long since peaked and has been declining in effectiveness for at least a decade. Today, newsprint and magazines and billboards are three of the least effective means of advertising real estate. This does not mean these tactics should never be used. It does mean that they should be used sparingly, and rationally based on the return for the dollar spent. For a long time now, the Internet has been used by real estate agents to post their listings in their local multiple listing service (MLS), and while that was originally only accessible by members of the MLS by subscription, it has become searchable by the public through what is called an IDX accessible database through the real estate agents’ websites. It doesn’t include all of the data available to agents, but at least it is a nice way for the public to plug in their parameters and be able to see what active listings are available. The Internet also has become a powerful tool to advertise listings on agent websites and blogs, as well as numerous subscription and online classifieds. Most agents (about 98% of them in my speculation) still are not in tune with this technology and are not using it to benefit their clients. Selling your own home in Sequim or in Port Angeles requires marketing knowledge, and the best marketers have been through the school of hard knocks, so they’ve learned some valuable lessons in selling a home. It takes courage to sell your home, especially in these challenging times, and there is risk that you will fail. Marketing is risky, because there are things that work well, things that don’t work at all, and some things that work a little. A FSBO might be willing to take on the risk to save a commission. This series is intended to provide guidance to help you avoid the major traps for the unwary. 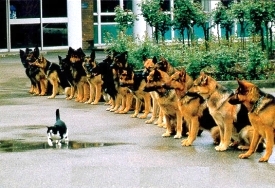 Don’t be like the cat in this photograph, which is taking incredible risk when it doesn’t have to. Risk should only be taken when it is balanced with the reward, and one should never take unnecessary risk. Traditional Advertising – What Works and What Doesn’t Work. Traditional newspaper advertising as a means to sell real estate has been dramatically losing its effectiveness over the past decade. This is common knowledge among top producing salesman in busy metropolitan areas, and many successful Realtors have testified that they have substantially reduced or even stopped using the newspapers to sell their listings. What’s interesting to me is that newspaper advertising is not only one of the least effective ways to sell real estate today, it is also one of the most expensive venues to advertise in. 1. You could sit on a house for sale for a year and still not sell it. That is a major non-event that disrupts lives and plans. 2. Even worse, you could actually sell your home and lose a lot of money. Money is hard enough to earn without burning it up for lack of knowledge. So how do you develop a powerful and effective marketing plan that will actually sell your home in this market? This assignment is far too big to tackle in one article, so this is the first in a short series that will answer the question with solid principles that work. Most home owners who decide to sell their home will either list it with a real estate agent or become a FSBO (pronounced “fizbo”). The term almost sounds derogatory, but no offense is intended by the term FSBO. It is the common nickname given to a for-sale-by-owner and has been for at least three decades. The point is simply that either your Realtor has to be an expert in marketing to sell your home, or if you are a FSBO, you must be the expert in marketing. In my 30 years in real estate, first as a Realtor and Associate Broker in Alaska in the mid ’70’s, then as a real estate attorney for 20 years, and now again as a Broker, I’ve seen many Realtor’s try to sell real estate who did not understand marketing. Remember the saying, “He knows just enough to be dangerous.” That cliche definitely applies to those who would market real estate today. I think most home owners understand that just because a person gets their real estate license, that does not mean they have mastered real estate. 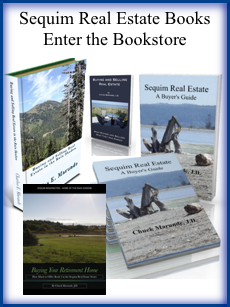 Buying or selling Sequim real estate or Port Angeles real estate? How you negotiate can mean $10,000 more or less in your pocket when the dust settles. Imagine two card players. One has spent a lifetime learning how to play cards, has become an expert on mathematics and statistical calculations, on human behavior and psychology, and has studied and practiced for decades. The other is a school teacher, a good and honest person, who has taught 3rd grade for 22 years, but has never played cards, and has had no interest in the technical skills required to be a good card player. Both enter a national card playing tournament. Who would you bet on? Who would win the majority of card games? So why would anyone with virtually no experience negotiating the purchase or sale of expensive houses, gamble when they buy or sell their own house? One might argue, “Well, I’ve sold two houses in my life.” Buying or selling one or two houses does not a lifetime of experience make. Don’t lose money negotiating your hard earned investment. If I seem passionate about this subject, it is because I am. I’ve seen people lose a lot of money simply because they assumed they could do what it has taken others a lifetime to learn. Assuming is gambling. Read more about negotiating the best price at Sequim Real Estate – Negotiating for $1,000’s. Want to sell your own home in Sequim or Port Angeles? How do you market your home in this economy? What techniques are best for selling? How do you get the highest price? This is Part 2 of a 6 part series answering these questions. Today’s Coverage: 2.) Figuring out the FMV and determining a realistic sales price. The single most important step in the process of successfully selling your home is coming up with a true FMV (fair market value). Price your house wrong on the market, and it may get stale, and either take much longer to sell at a lower price, or not sell at all this year. A Realtor can get a beautiful CMA (Comparative Market Analysis) from the MLS (Multiple Listing Service). If you’re not a member of the MLS, you won’t have access to all that data, so a FSBO (For-Sale-By-Owner) will have to resort to what are probably less accurate and more labor intensive methods to do a CMA. I have a strong conviction about arriving at the listing price, whether a FSBO or listed with a Realtor. I believe it must be an accurate FMV. An experienced Realtor using the MLS can arrive at an accurate FMV, but it takes hard work to make the necessary adjustments up and down for the comparables to arrive at the best FMV for your home. Because it is so hard for a FSBO to do this accurately without a lot of training and a current data base, I recommend hiring a licensed appraiser and paying him for what is the equivalent of a bank appraisal. It is extremely effective to show a prospective Buyer how you arrived at the asking price. They can’t really argue with it. It is well documented, has color pictures of the comps, includes all the amenities and the values, and has an authoritative bottom line number. This same appraisal is typically good for six months and probably can be used by your buyer with their own bank. While some appraisals take weeks to get done, your appraisal is already done and the Buyer can take it to the bank. What a great way to reduce unnecessary delays, especially with VA loans. The appraisal will cost $400, more or less, but just tell the Buyers that while you have done them a favor by getting it done in advance, you expect to be reimbursed at closing as it is normally their cost anyway. By the way, some special types of HUD loans or VA loans may require a bank appointed appraiser of their own choosing, but your appraisal still has all the benefit of accurate pricing to market and sell your home. I recently listed a home that had previously been listed for six months with another broker with no activity whatsoever. I sold it in about 30 days after listing, and I would attribute this success to effective marketing AND the right listing price. The listing price was $25,000 below a current bank appraisal, and I made it clear in the marketing that price was already negotiated and firm. Wrong pricing can be devestating. 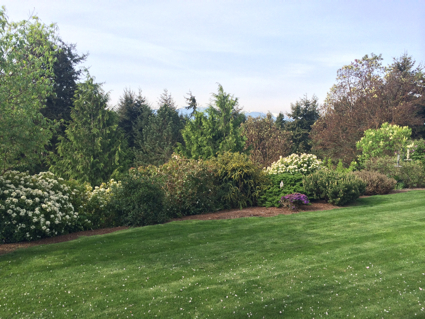 I noticed in my MLS that a 2.5 acre lot with a mountain view sold this past month for $139,000. What is interesting is that the original listing price was $239,000. Wow! What a discount! It would seem the original price was grotesquely over FMV by $100,000. Guessing what the FMV is on your property is just plain dumb. Don’t do it. Pricing is not science, but neither is it throwing dice. Admittedly there is a subjective aspect, but there is a great deal of solid mathematics involved, too. You have to know how to do the math. It may be obvious, but another great thing you accomplish by getting the appraisal done in advance is to reduce the offer/counteroffer/counteroffer exchange. Explain that the appraisal eliminates the uncertainty for them about what the FMV of the house is, eliminates the need for the games that Buyers and Sellers often play without an appraisal, both trying to take advantage of the other. This is very effective! What does it take to sell your own home in Sequim? How do you market your home in this economy? What techniques are best for selling? How do you get the highest price? I think of selling your house as a six part process: 1.) knowing the local real estate market, 2.) figuring out the FMV and determining a realistic sales price, 3.) developing an effective advertising plan, 4.) negotiating diplomatically but firmly to arrive at a price that pushes your buyer as far as they are willing to go, 5.) drafting the legal contracts as well as drafting unambiguous language that gets the property sold without legal problems, and 6.) avoiding the many traps for the unwary. Today’s Coverage: 1.) Knowing the local real estate market. Buyers sometimes come from outside our area, and if they are from an area where real estate is priced substantially higher, they might over pay for a property. The reality is that buyers are getting very well educated these days, and they are learning to negotiate hard. The Internet has become a very powerful tool educating both buyers and sellers, evidenced by you reading this. Buyers are able to view many homes on the Internet and compare features and prices. By the time a buyer looks at your home, they have looked at hundreds of homes on the Internet, and physically viewed a dozen or more homes in your market. The better you know the market, the better you will be prepared to negotiate the sale. 7. the market timing or the “when” of selling your home. WHEN you put your home on the market is a very important decision. First, the market might be in a correction mode, so it could be the worst time. Second, the season or time of the year can be disadvantageous. Third, annual events often create the best and the not-so-good times to put a house on the market, like school starting at the end of August. There are many things that effect timing decisions. You will want to be aware of these, because wrong timing can mean the house does not sell within a reasonable period of time, or it could mean you take a substantial cut on the price. Ouch! You would also benefit from having a written comprehensive plan. Do you know what you are going to do, and do you know when you are going to do it between now and closing? Chaos is not in your best interest when it comes to selling your home with so much money at stake. Write a good and thorough plan, including the contact information of key professionals you will involve, such as the title company, the escrow officer, inspector, loan officer, and so on. It’s what you don’t know that can come back to bite you. It has been said that we learn best by making mistakes, but it would be a disaster if you had to loose a lot of your money just to learn something about selling real estate. It is the intention of this series to help you avoid that kind of nightmare and to successfully sell your own home. If after studying everything you can get your hands on, you decide your want a Realtor, that is still your option, but at least you would be making a fully informed decision. Realize that the success of a FSBO is not so much in doing something extraordinarily good: the key is not making any major mistakes. Kind of sounds like a military career, doesn’t it? It means covering all the bases, and not falling into traps for the unwary. This is why a comprehensive plan is so important. It is your road map to success. Without the map, you may not end up at closing with the net proceeds you hoped to get. And then who wants to close a transaction, and later get sued because your paperwork opens you to legal liability. Should I Reduce My Price To Sell My Home? When a home is on the market for a long time and it still has not sold, a homeowner might legitimately ask his agent, or himself if he is a FSBO (for sale by owner), do I need to reduce my price? Have I overpriced my home? An overpriced listing is like death to a serious home seller, but sometimes the reason a home hasn’t sold has nothing to do with the current price. Elsewhere, I’ve written about the danger of overpricing, and that should be a consideration, but there is a huge factor that may be far more important in “getting attention” from prospective buyers. How well is your home being marketed? Is your marketing plan reaching buyers (wherever they may be) in this price range and for your area and for the floor plan and features of your home? If your marketing is ineffective, the price is not why your home has not sold. It’s because buyers are not even aware of your home. Anyone who reads my blog articles knows that one of my pet peeves is ineffective marketing of homes. So many FSBO’s and so many practicing real estate agents think that simply putting a house in the MLS and in some local newspaper ads is all there is to this marketing business. Some think they have the secret key, because they’ve placed a few haphazard ads on the Internet. There’s so much more to marketing and placement. There’s so much more to knowing how to reach prospects on the Internet. Why does a marketing expert like Jay Abraham get paid as much as $1 million dollars to draft one letter for major retailers? Because they can make an extra $200 million dollars in sales. Well, why not save all that money and simply pay a Boeing engineer to write a letter, or a retired sporting goods store owner, or a waitress? Because they don’t know how. Period. It doesn’t matter if they think they know, they don’t. That’s why Jay Abraham can charge so much. Because he produces results. If you had a home listed at $425,000, but it was not effectively being exposed to prospective buyers, you could drop the price to $400,000, and still you would have no activity, except tire kickers. You could drop the price 6 months later to $387,000, and still you would have no offers. How much money are you willing to lose until you actually sell it to someone who is just looking for a steal. It isn’t always about price. Selling your home is effective marketing plus a reasonable listing price. Effective marketing is not for the inexperienced. The difference between good marketing and poor marketing is 60 DOM or 324 DOM. It gets even better than that. The house that is on the market for a long time before it sells will also get a lesser price than the same house sold in 60 days with good marketing. If you’re selling your home soon, be careful. It’s dangerous out there. There are many Traps for the Unwary, and a poor marketing plan is one of those traps. Want to sell your home on your own? Use the Subject Index on this blog in the right hand column entitled “FSBO” and you’ll find a series of articles and help. And there are more articles coming, so check back regularly, or subscribe to this blog by going to the subscription link in the right hand column.Courtesy Sequim & Port Angeles Real Estate, LLC.